Walking a dog may sound easy, yet many dog owners have a problem with this. When they are walking their dogs, their dogs just can’t stop pulling and tugging at their leash. It seems like your dogs are behaving out of control. 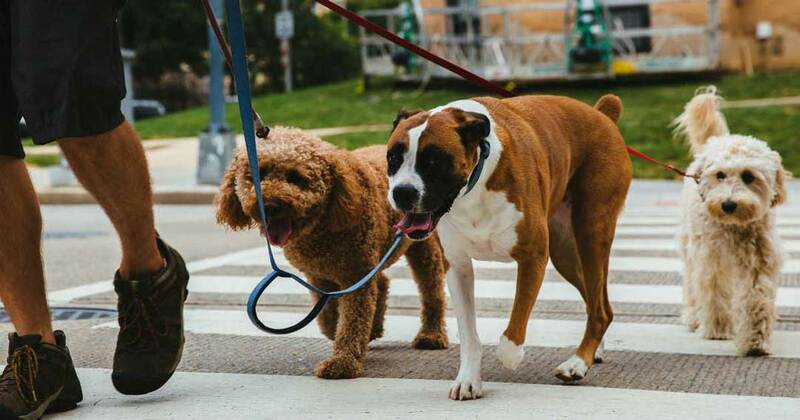 Here are some tips that on how you can make your walks smoother and more enjoyable for both you and your furry companion. You can try various kind of leashes. The key of choosing a leash is to choose the leash that is most comfortable for both you and your dog. Leather leash is a good option as it lasts longer and feels easy in the hands. if your dog has a habit of chewing or breaking leashes, you may consider to use chain leash instead. However, you need to be extra careful when you are using a chain leash as excessive chewing on chain leash can lead to damage to your dog's teeth. Using a short leash allows you to have more control on your dog. It is easier to communicate and guide your dog when your dog is close to you. You want your dog to focus on you,not everything else around you. If you walk in front of your dog, your dog will see you as the pack leader and will ultimately follow you. If you let your dog take the lead, he will consider himself the pack leader and dragging you to the direction it wants to go. A dog that is 'at heel' is walking closely behind or alongside with its owner. A dog that is at heel won't pull the leash. Most dogs aren't born to know the proper ways to heel, so you have to teach him. A quick trick to deal with pulling is to use treats to lure or direct him to the direction you want to go. When your dog is pulling, stop right in the middle of the walk. He will stop pulling when you stand still. A dog harness will allow you to have greater control on your dog. Harnesses can also prevent neck or trachea injury when your dog is constantly pulling or fighting the leash. Roaming and exploring are dogs'natural instincts. Your dog will be happy if you take him to explore various places. When your dog is satisfied, he is more likely to be well-behaved at home. This is a win-win situation for you and your dog. A 30 minutes to 1 hour walk is recommended. There had been many cases reported where the dog owner lost his or her dog during the walk.Ensure you dog wear an ID tag on his collar and have him microchipped for security precautions. Remember to keep the details on the ID tag updated from time to time. Walking is draining exercise for you and your furry companion. After the walk, treat him to food and fill up his water bowl to replenish his energy.